Dunningworth no longer exists, apart from the Hall (in reality, barely more than a farmhouse) and also - no, I'll come back to that in a moment. If you can bear to leave the main Woodbridge to Snape road for a bit (this will mean slowing down considerably, so you may prefer not to) you can turn off at Tunstall and cut up through the lovely village of Blaxhall, home to the events in George Ewart Evans' masterpiece Ask the Fellows Who Cut the Hay. Blaxhall church contains more of the work of the Rope family than any other church in Suffolk, so I expect you to go and take a look as a priority; but there is something else in the parish worthy of mention, if only in passing. As you leave this sleepy little hollow on the way back to the busy Snape road, notice the woods on your right. The roads around here are so little used that you may afford yourself the luxury of seeing how they dovetail into a field about a mile after leaving Blaxhall village centre. 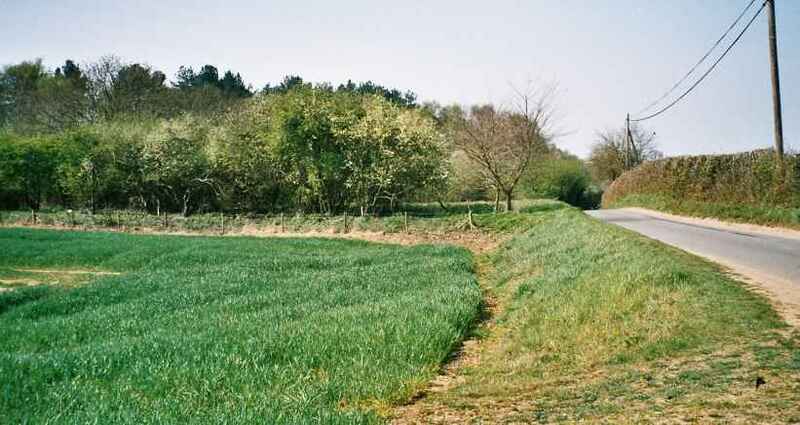 Here, an old hedgerow leads up to a banked corner of the field. At Domesday, this was the site of St Mary's church, the beating heart of a parish that has almost completely disappeared. John Blatchly records that it is last heard of in the 1254 taxation roll, and that by 1600 certainly it was gone. It may be one of the few churches in Suffolk to be lost by depopulation rather than Reformation. 1254 is close enough to the epidemics of the late 1340s that wiped out two thirds of the population of Suffolk for us to consider they might have been a cause; in general, because East Anglia was the most populous part of England until the Industrial Revolution, there are very few lost villages. However, Dunningworth is different to many of Suffolk's other churches in that it was parochial, not a Priory out-station, so again Church politics do not appear to be to blame. Intriguingly, Blatchly reports that in 1926, remains were still discernible, and in recent years the plough has put up flint rubble. The 13th century was a time of considerable rebuilding in Suffolk, so there may still be much on this site to be found. An excavation on 1844 unearthed a large number of skeletons, which I suppose was not unexpected. Just beyond the church, and past the Hall, you will find the heart of Dunningworth today. Although the parish has been split, and subsumed into Blaxhall, Tunstall and Snape, it used to include the south bank of the river Alde, and because of this the historic parish includes the great complex of concert hall, galleries and gift shops that today we call Snape Maltings; indeed, White's Suffolk Directory of 1844 records that Newson Garrett, who started it all, lived at Snape Bridge Maltings, Dunningworth.